Introduction: The objective of this study was to evaluate the effect of SmearOFF, 7% maleic acid (MA) and 17% ethylenediaminetetraacetic acid (EDTA), on the surface microhardness of Biodentine (BD). Materials and Methods: Forty BD cylindrical-shaped specimens were prepared using a split mold and were divided randomly into four groups (n = 10) based on the type of irrigant used for 1 min. In Group I, the specimens were treated with 17% EDTA, in Group II with 7% MA, in Group III with SmearOFF solution, and in Group IV with 5 mL distilled water. In all these groups, the irrigants were taken in a beaker and the samples were immersed with a magnetic stirrer placed to ensure complete wetting of the specimens. All the samples were then washed with distilled water and air-dried. The surface microhardness of the specimens was measured using Knoop hardness tester. Data were analyzed statistically using Kruskal–Wallis and Mann–Whitney U-test. The significant level was preset to P = 0.05. Results: MA significantly compromised the microhardness of BD followed by EDTA, SmearOFF, and distilled water which was statistically significant (P < 0.001). On comparison between 17% EDTA and SmearOFF, 17% EDTA reduced microhardness to maximum (P < 0.05). Conclusion: In conclusion, the present study demonstrated that microhardness of BD cement was generally affected by chelating agents. A diversity of calcium silicate-based materials has been advanced recently in endodontics for various applications such as perforation repair, vital pulp therapy, apical plugs, root end filling, and root canal obturation.,, Mineral trioxide aggregate (MTA) is one of the commonly used calcium silicate-based cement in endodontics. Several studies have demonstrated the potential of MTA to be used in clinical cases., Despite its numerous favorable properties, it has several shortcomings such s long setting time, high solubility, discoloration potential, handling difficulties, and expensive.,, Biodentine (BD) (Septodont, St. Maur-des-Fosses, France) is a calcium silicate-based material which has shown to overcome the shortcomings of MTA. It consists of tricalcium silicate, zirconium oxide, calcium carbonate and a water-based liquid. This liquid contains calcium chloride accelerator and water as a reducing agent., BD has good sealing ability, short setting time, high compressive strength, low discoloration potential, biocompatibility, and biomineralization properties.,,,, Due to its favorable properties, it is suggested to be used as an endodontic repair material such as perforation to minimize the bacterial contamination and irritation to periodontium due to the seepage of irrigating solutions. The fundamental requirements for the success of the root canal treatment are shaping and cleaning of the root canal system. This can be accomplished using a combination of mechanical instrumentation and chemical irrigating solutions. The instrumentation of the root canals with either manual or rotary methods produces amorphous smear layer which contains inorganic dentin debris along with organic materials such as pulp tissue, necrotic debris, microbes, and their metabolic products., Removal of smear layer during endodontic treatment will result in achieving a three-dimensional fluid-tight seal of the root canal system as well as facilitating the penetration of intracanal medicaments and root canal sealers into the infected dentinal tubules., Combined application of sodium hypochlorite (NaOCl) and ethylenediaminetetraacetic acid (EDTA) is generally used for the efficient removal of the smear layer from the root canal system. Maleic acid (MA) is a smear layer removal agent which has displayed significant smear layer removal capacity compared to 17% EDTA, particularly in the apical third of the root canal system., It has also revealed less cytotoxicity when compared to that of EDTA. SmearOFF (Vista Dental Inc., USA) is a smear layer removal agent recently introduced into endodontics. It consists of EDTA and chlorhexidine gluconate (CHX). The manufacturer claims that it does not form a precipitate when mixed with NaOCl and thus does not require an additional rinse following NaOCl irrigation. In addition, the manufacturer claims that SmearOFF yields better calcium suspension and clears more dentinal tubules compared to EDTA. In general, it should not be used concurrently with NaOCl because of the rapid displacement of available chlorine. The endodontic repair material often comes in contact with various endodontic irrigants during shaping and cleaning of the root canal system. Guneser et al. 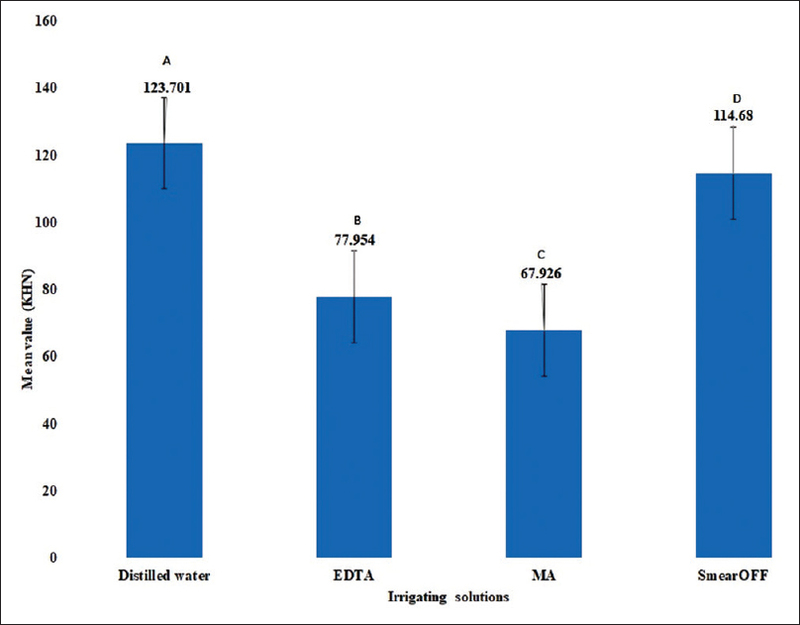 have evaluated the influence of different root canal irrigating solutions on the push out bond strength of BD and MTA. They concluded that BD demonstrated a considerable performance after being exposed to root canal irrigants as compared to MTA. Ballal et al. evaluated the effect of various acids on the microhardness, surface topography, and push out bond strength of BD to root canal dentin. They reported that MA, EDTA, and phosphoric acid altered the surface morphology and reduced the microhardness of BD. Till date, there are no studies evaluating the effect of SmearOFF on the microhardness of BD. Hence, the aim of this in vitro study was to evaluate the effect of SmearOFF, 7% MA, and 17% EDTA on the surface microhardness of BD. Group 4: The specimens were treated with 5 mL distilled water (control) for 1 min. In all these groups, the irrigants were taken in a beaker and the samples were immersed with a magnetic stirrer placed to ensure complete wetting of the specimens. After 1 min of treatment, all the specimens were washed with distilled water and air-dried. The surface microhardness of the specimens was measured using Knoop hardness tester (Matsuzawa Seiki Co. Ltd, Tokyo, Japan), with the indentations made using diamond indenter at three different locations using 200 g load and 20 s dwell time. The diamond-shaped indentations were observed in an optical microscope with a digital camera, and the length of the two diagonals was measured accurately using image analysis software (Matsuzawa Seiki Co. Ltd, Tokyo, Japan) for calculating the microhardness value. The representative hardness value for each specimen was acquired as the average of the results of the three indentations. The microhardness values among the different experimental groups were analyzed statistically using Kruskal–Wallis and Mann–Whitney U-test. For all analyses, the significance level was preset at P = 0.05. The mean microhardness values between the different experimental groups are shown in [Figure 2]. The MA group reduced the microhardness to the maximum and distilled water reduced to minimum as compared to SmearOFF and 17% EDTA which was statistically significant (P < 0.001). On comparison between 17% EDTA and SmearOFF, 17% EDTA reduced microhardness to maximum (P < 0.05). BD was reported to display a remarkably consistent performance even after exposure to an endodontic irrigant such as NaOCl, CHX, and saline solutions regardless the effect on the surface morphology of BD. Similar findings were reported by Ballal et al. The present study assessed the effect of SmearOFF irrigating solution on the microhardness of BD cement. All the chelating agents used influenced the microhardness of BD when compared to the distilled water. The microhardness of BD was reduced significantly when it was treated with 7% MA. This may be due to the acidic pH of 7% MA (1.3) which must have inhibited the complete setting of BD. It has been demonstrated by the previous studies that the physical properties of calcium silicate cement are affected by low pH environment., In addition, the mechanical properties (compressive strength) of different tricalcium silicate cement get deteriorated in the presence of an acidic environment. The low pH might inhibit the setting reaction, adhesion, and increase the solubility of calcium silicate cement which can affect the surface microhardness., Furthermore, it has been reported that acidic pH causes modifications on the BD surface morphology which in turn may affect the surface hardness. In the present study, the superior effect of SmearOFF on the microhardness of BD cement may be attributed to its alkaline pH of 7.2. The combination of CHX and EDTA present in SmearOFF solution would have chelated lesser calcium ions released from BD cement resulting in improved microhardness of BD. Furthermore, Krishnan et al. reported that SmearOFF when mixed with NaOCl solutions causes a marked reduction in free available chlorine in a similar manner to that of EDTA. They concluded that its combined use with NaOCl could not be recommended. Hence, use of EDTA or MA should be minimized in root canals restored with BD in order to prevent the deterioration of BD material, which is important for its long-term success in endodontic procedures. Microhardness of a material is influenced by its yield strength, tensile strength, modulus of elasticity, and stability of its crystal., It is an indicator of the overall strength or resistance to deformation of a material. Evaluation of microhardness is clinically important, especially when BD cement is placed in areas of furcal perforation repairs. In conclusion, the present study demonstrated that microhardness of BD cement was affected by chelating agents. SmearOFF can be used as a safe endodontic irrigant in canals restored with BD. Asgary S, Shahabi S, Jafarzadeh T, Amini S, Kheirieh S. The properties of a new endodontic material. J Endod 2008;34:990-3. Noetzel J, Ozer K, Reisshauer BH, Anil A, Rössler R, Neumann K, et al. Tissue responses to an experimental calcium phosphate cement and mineral trioxide aggregate as materials for furcation perforation repair: A histological study in dogs. Clin Oral Investig 2006;10:77-83. Aeinehchi M, Eslami B, Ghanbariha M, Saffar AS. Mineral trioxide aggregate (MTA) and calcium hydroxide as pulp-capping agents in human teeth: A preliminary report. Int Endod J 2003;36:225-31. Qudeimat MA, Barrieshi-Nusair KM, Owais AI. Calcium hydroxide vs. Mineral trioxide aggregates for partial pulpotomy of permanent molars with deep caries. Eur Arch Paediatr Dent 2007;8:99-104. Fridland M, Rosado R. MTA solubility: A long term study. J Endod 2005;31:376-9. Islam I, Chng HK, Yap AU. Comparison of the physical and mechanical properties of MTA and Portland cement. J Endod 2006;32:193-7. Laurent P, Camps J, About I. Biodentine (TM) induces TGF-β1 release from human pulp cells and early dental pulp mineralization. Int Endod J 2012;45:439-48. Tran XV, Gorin C, Willig C, Baroukh B, Pellat B, Decup F, et al. Effect of a calcium-silicate-based restorative cement on pulp repair. J Dent Res 2012;91:1166-71. Yoldaş SE, Bani M, Atabek D, Bodur H. Comparison of the potential discoloration effect of bioaggregate, biodentine, and white mineral trioxide aggregate on bovine teeth: In Vitro research. J Endod 2016;42:1815-8. Rajasekharan S, Martens LC, Cauwels RG, Verbeeck RM. Biodentine™ material characteristics and clinical applications: A review of the literature. Eur Arch Paediatr Dent 2014;15:147-58. Koubi G, Colon P, Franquin JC, Hartmann A, Richard G, Faure MO, et al. Clinical evaluation of the performance and safety of a new dentine substitute, biodentine, in the restoration of posterior teeth-a prospective study. Clin Oral Investig 2013;17:243-9. Laurent P, Camps J, De Méo M, Déjou J, About I. Induction of specific cell responses to a ca(3)SiO(5)-based posterior restorative material. Dent Mater 2008;24:1486-94. Jeevani E, Jayaprakash T, Bolla N, Vemuri S, Sunil CR, Kalluru RS, et al. “Evaluation of sealing ability of MM-MTA, endosequence, and biodentine as furcation repair materials: UV spectrophotometric analysis”. J Conserv Dent 2014;17:340-3. McComb D, Smith DC. A preliminary scanning electron microscopic study of root canals after endodontic procedures. J Endod 1975;1:238-42. Orstavik D, Haapasalo M. Disinfection by endodontic irrigants and dressings of experimentally infected dentinal tubules. Endod Dent Traumatol 1990;6:142-9. White RR, Goldman M, Lin PS. The influence of the smeared layer upon dentinal tubule penetration by plastic filling materials. J Endod 1984;10:558-62. Ballal NV, Kandian S, Mala K, Bhat KS, Acharya S. Comparison of the efficacy of maleic acid and ethylenediaminetetraacetic acid in smear layer removal from instrumented human root canal: A scanning electron microscopic study. J Endod 2009;35:1573-6. Ulusoy Öİ, Görgül G. Effects of different irrigation solutions on root dentine microhardness, smear layer removal and erosion. Aust Endod J 2013;39:66-72. Ballal NV, Kundabala M, Bhat S, Rao N, Rao BS. A comparative in vitro evaluation of cytotoxic effects of EDTA and maleic acid: Root canal irrigants. Oral Surg Oral Med Oral Pathol Oral Radiol Endod 2009;108:633-8. Vista Dental Products. SmearOFF 2-in-1. Available from: http://www.vista-dental.com/smearoff-2-in-1/. [Last accessed on 2018 Jul 2018]. Krishnan U, Saji S, Clarkson R, Lalloo R, Moule AJ. Free active chlorine in sodium hypochlorite solutions admixed with octenidine, smearOFF, chlorhexidine, and EDTA. J Endod 2017;43:1354-9. Guneser MB, Akbulut MB, Eldeniz AU. Effect of various endodontic irrigants on the push-out bond strength of biodentine and conventional root perforation repair materials. J Endod 2013;39:380-4. Ballal V, Marques JN, Campos CN, Lima CO, Simão RA, Prado M. Effect of chelating agent and acids on Biodentine. Aus Dent J 2018;63:170-6. Namazikhah MS, Nekoofar MH, Sheykhrezae MS, Salariyeh S, Hayes SJ, Bryant ST, et al. The effect of pH on surface hardness and microstructure of mineral trioxide aggregate. Int Endod J 2008;41:108-16. Lee YL, Lee BS, Lin FH, Yun Lin A, Lan WH, Lin CP, et al. Effects of physiological environments on the hydration behavior of mineral trioxide aggregate. Biomaterials 2004;25:787-93. Mohebbi P, Asgary S. Effect of pH on physical properties of two endodontic biomaterials. J Conserv Dent 2016;19:212-9. Elnaghy AM. Influence of acidic environment on properties of biodentine and white mineral trioxide aggregate: A comparative study. J Endod 2014;40:953-7. Yan P, Peng B, Fan B, Fan M, Bian Z. The effects of sodium hypochlorite (5.25%), chlorhexidine (2%), and glyde file prep on the bond strength of MTA-dentin. J Endod 2006;32:58-60. Al-Zubaidi AK, Al-Azzawi AK. The effect of various endodontic irrigants on the sealing ability of biodentine and other root perforation repair materials:In vitro study. J Baghdad Coll Dent 2014;26:1-8. Bentz DP. Cement hydration: Building bridges and dams at the microstructure level. Mater Struct 2007;40:397-404. Gilman JJ. Chemical and physical hardness. Mater Res Innov 1997;1:71-6. Blake A. Hand Book of Mechanics: Materials, and Structures. 1st ed. New York: Wiley IEEE; 1985.